The EVO dog food brand offers what they call “The Ancestral Diet Meets Modern Nutrition”. Though this may sound fancy, the underlying principle is quite simple – wholesome pet foods made with real ingredients. This brand was among the first to offer grain-free kibbles starting in 2004 and all of their products are designed in keeping with in a nutritional philosophy that is rooted in quality. Made with only the freshest natural ingredients, this brand’s products are designed to mimic the natural evolutionary diet of wild dogs, thus ensuring that your dog will be able to digest it properly. This brand uses premium animal proteins, whole grains, and fresh fruits and vegetables in each of their recipes to ensure complete and balanced nutrition for dogs in all life stages. They also offer special formulas for small-breed and large-breed dogs. Overall, this is a good brand of dog food – keep reading to learn more about EVO dog food reviews. The EVO brand of dog food was once produced by Natura Pet Products, a company that is owned by Proctor & Gamble. In 2014, the company was sold to Mars, Inc. which is the sixth largest privately held company in the United States and a global manufacturer of pet food products. Some of the other brand names under the Mars, Inc. umbrella include Eukanuba, Greenies, Iams, Nutro, Pedigree, Pill Pockets, Royal Canin, Sheba, and Whiskas. The packaging for EVO products still carry the statement, “Made by Natura in Our Fremont, Nebraska Plant”. This being the case, it is accurate to say that this brand is made in the USA. It is important to note, however, that just because a product is made in the United States, it doesn’t necessarily guarantee that all of the ingredients were sourced there. The brand website speaks to the quality and safety of their ingredients, but not to the specific locations from which they are sourced. The EVO brand states that they use “only high-quality, natural ingredients to create foods that are denser and richer in essential nutrients” than the typical kibble. Because their products are so nutrient-dense, your dog doesn’t need to eat as much of it. Their ingredients include things like nutritious animal proteins, whole grains, healthy fats, and fresh fruits and vegetables as well as beneficial supplements. Furthermore, their products don’t contain any artificial additives such as colors, flavors, or preservatives and their recipes are free from corn, wheat, and soy ingredients. In June 2013, the FDA issued a recall for certain dry dog, cat, and ferret foods due to a potential for salmonella contamination. This recall affected all lot codes and package sizes with best-by dates before June 10, 2014. In November 2014, the FDA issued a recall for four lots of Grain-Free Turkey & Chicken Formula dry cat food due to inaccurate levels of vitamins and minerals. 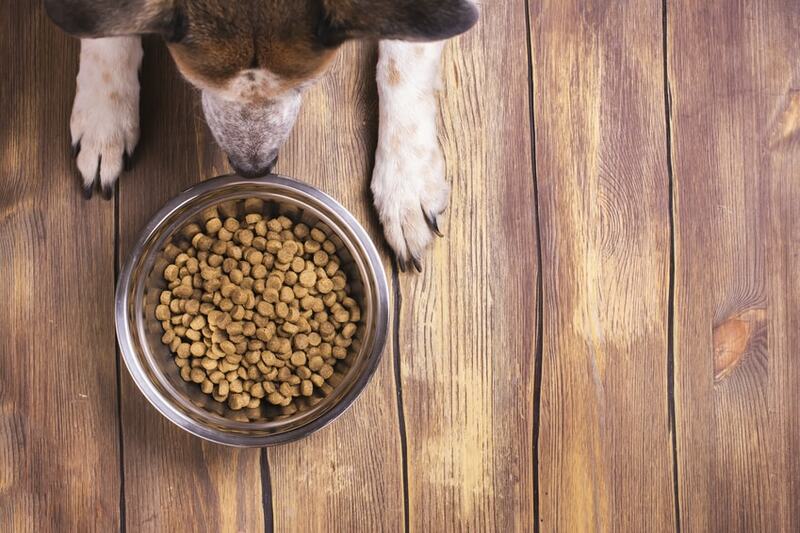 No dog food products were affected by this particular recall. The EVO brand isn’t one of the cheaper dog foods on the market, but you shouldn’t expect it to be due to the quality of their ingredients. You can find this brand in specialty pet food stores and some local pet store chains as well as online retailers. If you want to save money on this brand, you may be able to find EVO dog food coupons online or from independent retailers. According to the brand website, EVO uses only whole pet food ingredients that are rich in nutrients. Their products are properly balanced with protein, fat, and carbohydrate as well as essential vitamins and minerals to ensure that your dog’s nutritional needs are met. Not only that, but their formulas are subjected to rigorous testing to ensure quality and safety. All of these things being true, you should expect to pay more for this brand than you would for the average kibble. For a 28.6-pound bag of dry food, you will pay between $60 and $85, depending on the recipe. For a 12-pack of 13-ounce cans of wet food, you’ll pay somewhere between $25 and $30 – that averages to about $2.30 per can. To save on this brand, look for EVO coupons online. The EVO brand is not one of the largest pet food brands on the market. In fact, they only offer a total of seven dog food products – five dry foods and two canned foods. Though this brand may not offer as much variety as other brands, you can count on the fact that each of the products they DO offer will be of the highest quality. Not only is this brand committed to maintaining high standards for quality and safety with their products, but they don’t cut corners with ingredients and they make every effort to ensure that their products are “denser and richer in essential nutrients” than the average kibble. Although this brand doesn’t offer much in the way of variety, you can rest assured that their limited array of products are each an example of high-quality nutrition for your dog. Each recipe begins with a premium-quality protein and is supplemented with digestible carbohydrates and healthy animal fats. This brand formulates their products not only to provide optimal nutrition, but they also support your dog’s healthy digestion as well as his healthy skin and coat. This brand doesn’t take shortcuts like other companies when it comes to the quality of their ingredients or the safety of their manufacturing processes. Because this brand uses only the best ingredients in their limited pet food products, most EVO reviews are very complimentary. Pet owners know that this is a brand they can trust and you can trust them as well! Keep reading to receive our reviews for one dry food and one canned food product. EVO Herring & Salmon Formula Adult – This Herring & Salmon Formula Adult Dog Food Recipe is inspired by nature, made with premium animal proteins and free from grains, gluten, and potatoes. It features 78% high-quality animal ingredients such as herring, salmon, and eggs as well as 22% fresh fruits and vegetables. This recipe is exactly what your dog needs to maintain a lean, conditioned body and to maintain his total health and wellness through the power of quality nutrition. It is supplemented with glucosamine and chondroitin for joint support as well as high levels of omega-3 fatty acids for healthy skin and coat. It is an excellent alternative to raw food if you want your dog to have the benefits of raw ingredients but the convenience of dry food. The first ingredient in this Herring & Salmon Formula Adult Dog Food Recipe is, of course, fresh herring. This ingredient is followed immediately by salmon meal and menhaden meal and, later, by fresh salmon and eggs. All of these are meat-rich sources of animal protein which means that they are highly digestible and they offer excellent bioavailability for your dog – they are also complete proteins so they contain all of the essential amino acids your dog needs. Overall, this recipe contains 42% crude protein which is one of the highest in the industry. The fat in this formula comes mainly from the menhaden oil but is supplemented by the sunflower oil. It is good to see an animal-based fat as the primary fat, though sunflower oil helps to balance out the omega-3 and omega-6 fatty acid content. After the protein ingredients come tapioca starch and peas, the main sources of carbohydrate energy in this recipe. These are gluten-free and grain-free carbohydrates which means they are highly digestible for most dogs – they are also a good source of dietary fiber to support your dog’s digestion. For supplemental dietary fiber, there is also pea fiber, dried chicory root extract, and several fresh fruits and vegetables. These fruits and vegetables also play the important role of acting as natural sources for key nutrients. There are, however, still some synthetic supplements including vitamins and chelated minerals. Chelated minerals are bound to protein molecules which makes them more easily digestible for your dog’s body. There are also dried fermentation products for probiotic support. This Herring & Salmon Formula Adult Dog Food Recipe is formulated to meet the nutritional levels established by the AAFCO Nutrient Profiles for maintenance. Overall, this Herring & Salmon Formula Adult Dog Food Recipe is an excellent source of quality nutrition for adult dogs. This formula starts off strong with one fresh meat and two meat meals as the top three ingredients, followed by gluten-free and grain-free carbohydrates. It is also great to see that this recipe features a premium animal fat in the menhaden fish oil and a plant-based fat as a supplementary source of omega oils. There are several fresh fruits and vegetables for supplementary fiber and as natural sources for key nutrients, though plenty of synthetic supplements to ensure nutritional balance. All in all, this formula is rich in meat and essential nutrients – it is also likely to be loaded with fresh meat flavor that your dog is going to love. If you’re looking for a protein-rich, balanced dry food for adult dogs, consider this Herring & Salmon Formula Adult Dog Food Recipe. EVO 95 Chicken & Turkey Recipe in Gravy Canned Food – This 95 Chicken & Turkey Recipe in Gravy Canned Food is described as the “ancestral diet, evolved” which means that it is based on the natural evolutionary diet of wild dogs but with modern nutritional improvements. This particular recipe is made with 95% animal protein including fresh chicken as the main ingredient. Made with plenty of fresh meat, this formula “gives your pet the protein he needs to promote a lean, conditioned body”. It is made only with the freshest, highly digestible ingredients in a recipe that is 100% complete and balanced for adult dogs. It is an easy alternative to raw food because it offers exceptional nutrition but it has a long shelf-life and an easy feeding process. Simply put, this formula is an excellent source of nutrition for your dog. As promised, the first ingredient in this 95 Chicken & Turkey Recipe in Gravy Canned Food recipe is fresh chicken. In a dry food product, a fresh meat like chicken might lose some of its volume during cooking because it contains around 70% moisture by volume. Because the moisture content of this recipe is so high (around 81%), however, that isn’t a problem here. Though fresh chicken is the main protein, this recipe also includes fresh turkey and chicken liver. In addition to being rich in protein, chicken liver is also rich in healthy animal fats and loaded with essential nutrients. Together, these three ingredients contribute to a total crude protein content of 8.5% which translates to a dry matter basis of 45%. After the three sources of protein and water sufficient for processing comes the fifth ingredient – fish oil. Though fish oil is a source of animal fat, it is an unnamed ingredient. Salmon oil or menhaden oil would be a more valuable ingredient here, though you can’t necessarily assume that the quality of the fish oil is low just because you can’t tell where it comes from. The quality of the EVO brand in general suggests that it is probably a safe ingredient. After the fish oil comes natural flavor followed by guar gum as a thickener and an assortment of mineral supplements. Most of these minerals are chelated which is good – it means that they are bound to protein molecules which makes them easier for your dog’s body to absorb. The remaining ingredients consist primarily of vitamin supplements and other nutrients. This 95 Chicken & Turkey Recipe in Gravy Canned Food is formulated to meet the nutritional levels established by the AAFCO Nutrient Profiles for adult maintenance. Overall, this 95 Chicken & Turkey Recipe in Gravy Canned Food is an excellent example of quality nutrition for adult dogs. This recipe starts off strong with fresh chicken as the first ingredient and it is supplemented with both fresh turkey and chicken liver as additional sources of animal protein. This recipe doesn’t contain any grains which makes it highly digestible for most dogs and it contains just 1% crude fiber which is well within the recommended range. It is somewhat disappointing to see fish oil as the only source of fat, though it may be better to see an unnamed animal fat than a named plant-based fat. All in all, this is a protein-rich and nutritious recipe that is also likely full of natural flavor.